Gujarati Sweets Recipes, Gujarati Mithai Recipes. Who doesn’t love sweets? The Gujaratis too are sweet-lovers, and their cuisine features a large selection of ‘mishthan’, which basically means mithai. Gujaratis love sheeras (Atta Ka Sheera ) and make a wide variety of these using different flours and lentils. There are also various unique sweets prepared for festivals and special occasions. Some of them are so easy that you can prepare them any time, even as a tea-time treat! I have thousands of memories with different Gujarati delicacies and would love to share them with you all. Being a Kutchi Gujarati, we preach Jhulelal and Jhulelal Jayanti is incomplete without the prasadam of Lapsi. Fada ni Lapsi is made by roasting broken wheat in ghee and cooking it with water or milk and finally adding sugar. This traditional recipe is subtly flavored with cardamom and has an intense aroma. Be it a family function, auspicious occasion, office pot party or just comfort food, Golpapdi or Mohanthaal has been a part of it always, at least in my life and I am sure in most Gujarati households. These melt-in-the-mouth desserts are made by roasting flour in oodles of ghee and finally garnished with dry fruits. They sure are a treat to the palate! More than the set cubes, I love Garam Golpapdi popularly known as Sukhadi. The taste of melted gur in ghee roasted wheat flour with milk is extremely delectable and irresistible. I remember my father boiling milk since 5 am so, that the gas range would be free before my mother gets up and starts cooking a grand meal for Raksha Bandhan or any special occasion. Basundi a creamy, luscious Gujarati dessert of thickened milk is similar to the North Indian rabdi. The addition of almonds and pistachios adds a bite to it, we even add chironji to it. Taste best when eaten with piping hot, deep-fried puri and any aloo shaak. Giving a twist to the authentic Basundi, try your hands on Pineapple Basundi an innovative fruity flavored tempting dish. Come summers, I and my brother not only waited eagerly for vacations but also for the arrival of the king of fruits, mango. Starting from May till the end of June, we ate Mangoes and Mango Custard. Doodh Keri is what we fondly call it, my mother made it and kept bowls of them in the refrigerator and we would relish it in the sunny afternoons. Aam raas drinking competition with cousins was a regular affair. Also, shrikhand got upgraded to Aamrakhand. We love our Jalebi-fafda as much as Jethalal from Tarak Mehta ka Ooltah Chashmah does. Sunday breakfast is the time for family bonding. Heavy breakfast of Jalebi and fafda with masala chai and late lunch of Dal dhokli is a common practice in most Gujarati houses. Try your hand at Gujarati special mishthans like Kopra Pak, Magaz, Doodh Paak and Atta Ka Sheera and surprise your friends and family! 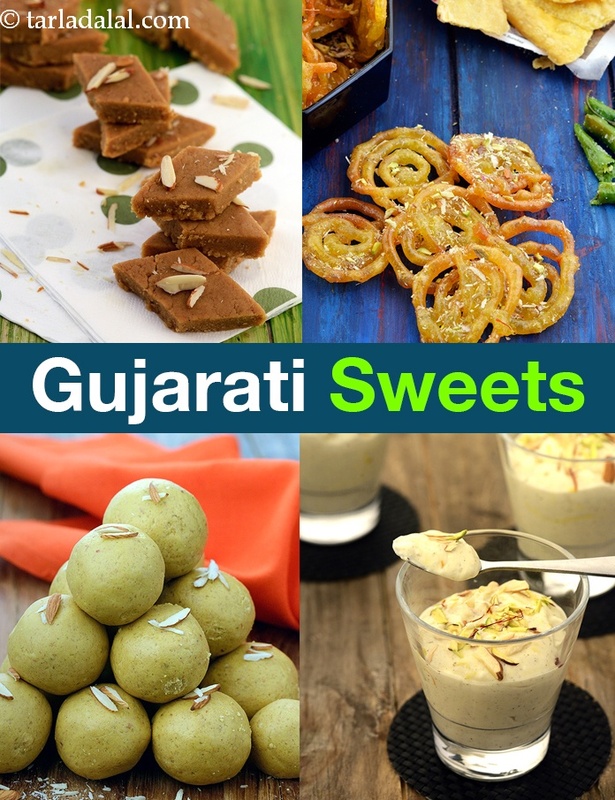 Enjoy our collection of Gujarati Mithai recipes, Gujarati Sweet recipes. Given below are Gujarati Recipe articles you will like. Traditionally made of whole wheat flour, easy and flavoursome Golpapdi can also be made more innovatively using a mix of jowar flour, soya flour and rice flour. Make them in advance and store in airtight containers so you can satisfy your hunger pangs with something sweet and healthy!